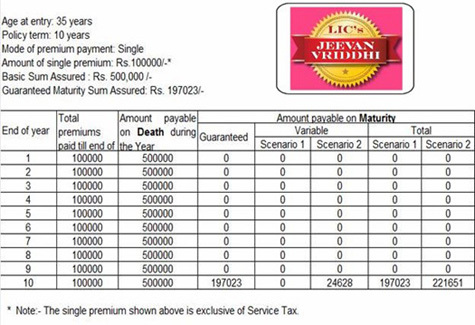 Life Insurance Corporation of India has launched a limited-offer single-premium policy Jeevan Vriddhi this plan promises to nearly double the premium amount at the end of 10 years. As life insurance plan it gives risk cover up to five times the Premium. This plan will be available only for next 6 months. 1) Death benefit: On death, Basic Sum Assured shall be payable. The Basic Sum Assured shall be 5 times the Single Premium excluding extra premium, if any. 2) Maturity Benefit: On maturity, the Guaranteed Maturity Sum Assured along with Loyalty Addition, if any, shall be payable. 3) Loyalty Addition: This policy will be eligible for Loyalty Addition on date of maturity, Rate and terms as may be declared by the LIC. 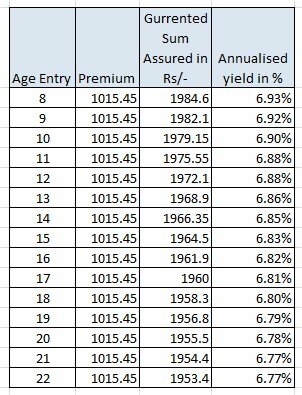 4) Incentive for Higher premium: If your premium is between Rs 50000.00 to Rs 99000, there is a 1.25% Increase in Guaranteed Maturity Sum Assured. If your premium is above Rs 100000.00, there is a 3% Increase in Guaranteed Maturity Sum Assured. 5) Liquidity: This plan provides facility same like fix deposit you can surrender this policy after 1 year. The minimum Guaranteed Surrender Value allowable is equal to 90% of the Single premium paid excluding extra premium, if any. You can to take loan on this plan after 1 year. 6) Tax Benefit: You can avail tax benefit under 80 C for premium paid under this plan. Similar to other plan maturity amount is tax free. Minimum entry age for this plan is 8 years and maximum is 50 years. Term of this policy is fixed 10 years. The Minimum sum assured is 1.5 lakh no upper limit on maximum sum assured. The minimum premium under the policy is Rs 30,000 and shall increase in multiples of Rs 1,000. So over all this policy also gives same kind of return 5-7% like any other endowment plan. Look at another example given by LIC on website. If you purchase this policy at the age of 35 years with basic sum assured as Rs 5 Lakh, you need to pay Rs 1 Lakh as annual premium. At the end of 10 years you will get guaranteed return of Rs 1.97 Lakh or Rs 2.21 lakh Take a look at example given by LIC in following figure. Premium shown in below example is exclusive of service tax if you make actual calculation with service tax than premium will be Rs. 101545 /- (@1.545% service tax). Effective yield in this case will be around 6.85%. Risk cover by Jeevan Vriddhi policy is just five times of premium paid which may not be sufficient considering your income. Adequate insurance cover must be five to six times of your income. So, If you decide to purchase this policy for risk cover premium value will be huge it will be difficult to manage it every year. For Risk cover Term plan is more suitable option. Insurance is not product for tax saving. There are many other option like ELSS which can provide you better return than Jeevan Vriddhi with tax saving. Consider that your 80 C limit are not exhausted and still scope of Rs.30000 is balance, if you purchase this plan with annual premium of Rs 101545/- you can save Rs. 30,000/- as tax benefit. Your yearly out go on this policy in this case becomes Rs 71545/-. At maturity you will be getting guaranteed Rs 221651 tax free. Yield in this case will be 10.70%. Good ELSS with tax saving can easily provide return more than this. If you consider Jeevan Vriddhi for Investment like one time Fix deposit for 10 years than also effective yield as stated above will be in range of 6-8%, Most of the banks provides fix deposit with rate of interest more than 10% now a days. (1) Loyalty addition shown is approximate amount calculated based on few assumption actual return may vary and depends upon LIC. (2) Tax benefit on this product is as per current tax law which may change after applicability of Direct Tax code from April, 2012. (3) Tax on maturity amount is not applicable as on today may be applicable after 10 year. 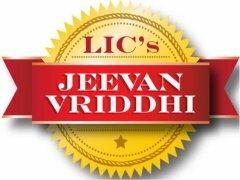 I hope we have done our job with sense of your satisfaction, now it is up to you to either invest in LIC Jeevan Vriddhi or not. Please don’t buy any LIC products. Please buy a term policy if need insurance and invest rest of the money in PPF. Effective returns will be around 7%. If you are thinking this policy as investment option please don’t opt for it. One should not invest in this plan…..Guys..what do you say ?